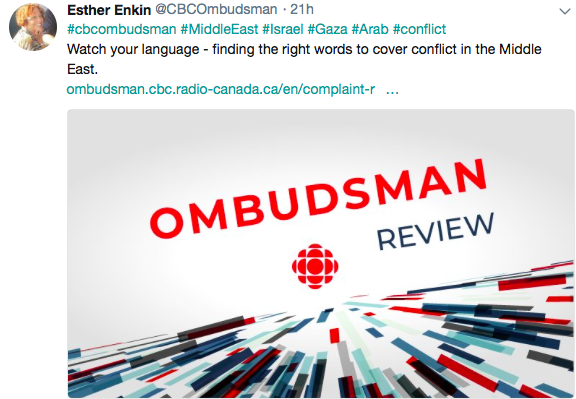 On September 17, CBC Ombudsman Esther Enkin published a review in response to an arbitration request by Hanna Kawas, Chair of the the anti-Israel group “Canada Palestine Association”, who claimed that the CBC “followed the dictates of the Zionist lobby group ‘HonestReporting’”. The full review is appended below or can be read online by clicking here. We’re flattered that this anti-Israel group recognize that we’ve been influential in holding the CBC to account for its biased reporting of Israel, but if we really did control the CBC’s coverage, why are we constantly having to file complaints to counter its unfair, unbalanced and inaccurate reporting of Israel and the Middle East!!! Watch your language – finding the right words to cover conflict in the Middle East. The complainant, Hanna Kawas, Chair of the Canada Palestine Association, accused CBC News staff of adapting coverage of the Land Day protests on the Israel-Gaza border to meet the dictates of a pro-Israel advocacy group. He thought the coverage downplayed the deaths of Palestinians and contained inaccuracies. Language usage around this conflict is always fraught – any language changes made were consistent with CBC New’s own guidelines.The stories reported the facts appropriately as events unfolded. The stories reported the facts appropriately as events unfolded. You thought he deliberately downplayed the use of live ammunition, which you believe is part of a pattern to distort and downplay Israeli actions. In a similar vein, you noted an AP story published on the CBC News website the same day. They complained in regards to this report, that “it’s false to claim that in the 1948 war that ‘hundreds of thousands of Palestinians were forced from their homes during the Israeli War of Independence in 1948…’”. You believe HonestReporting Canada “dictated” acceptable terminology, which was that it was correct to say people were displaced and that journalists should say people voluntarily fled – and that it was unfair to state they were forced out. You see this as a pattern of obscuring the truth, reflecting only the position of the Israeli government, and acquiescence to advocacy groups like HonestReporting Canada. The Executive Director of CBC News, Jonathan Whitten, replied to your concerns. He explained that all through the day of March 30th, Mr. Stoffel filed multiple reports about events occurring during the Land Day protest at the Israel-Gaza border. The report you cited was broadcast on News Network at 6:40 a.m. EST and he noted that the level of violence escalated as the day went on – which was reflected in the reporting. In that first report he mentioned that one Palestinian had been killed before the demonstrations began and noted a report of a second person who had been killed. Two hours later, he told you that Mr. Stoffel filed another report, reflecting the growing number of casualties. In that report he stated that at least 7 Palestinians had been killed and hundreds wounded, and concluded by quoting Israeli human rights organizations were demanding an investigation into the Israel Defense Forces use of live ammunition. He did not agree that the reporting distorted reality or attempted to downplay the violence. However, there is nothing in the existing sub-headline that could reasonably be understood as indicating causality. It simply says that the protest has “escalated into rock-slinging, tear gas firing”, giving equal weight to activities on both sides of the fence. To the extent that Derek changed wording as the fast moving events of the day unfolded, it was to bring that wording into line with our own language guide. The current guide is based on a careful review of Israeli and Palestinian positions on language, on applicable international law, on usage recommended by the United Nations, on editorial guidelines published by respected news organizations, and input from our foreign correspondents. We do this to assist our journalists so that they live up to our principle of impartiality. Our goal is to provide information and context so that people can draw their own conclusions on the controversies of the day. These guidelines offer suggestions for language that will avoid taking sides. He added that the two examples of CBC language usage being questioned by HonestReporting Canada were two of hundreds from the organization which accuse CBC of bias. He said CBC News staff look at each of them, as they do other criticisms or accusations of other sides in the conflict. They adjust the work when they have made errors or violated CBC journalistic policy. In relation to your concern about a description of the events of 1948, the CBC language guide suggests using the phrase that Palestinians “fled or were forced from their homes.” It is used because it “neither endorses nor opposes the right of return.” He added if you heard Mr. Stoffel use different language in a later report, it is because in the course of live reporting sometimes there are deviations, but the phrase he used in the evening report has been CBC practice for years. You are correct that reporters and editors must carefully weigh and consider the language used in areas of conflict. CBC Journalistic Standards and Practices calls for fairness and balance – a representation of a range of perspectives, but also full independence in its own choices. Like other news organizations, CBC News staff must navigate between the strongly-held views of the various sides in this conflict and yet use language which is accurate and clear. As Mr. Whitten told you, CBC’s choices are based on the considerations of those ranges of views – as well as best practices from well-respected news organizations and news institutes, and recommendations of their own foreign correspondents. I appreciate that you strongly see the matter in a particular way – and you consider it the correct one – but there is more than one view and layers of complexity and nuance. The Israeli–Palestinian conflict has been going on for several bloody and violent decades, sustained by negative and traumatic experiences on both sides. It often dictates the region’s agenda and naturally receives extensive media coverage. A society engrossed in conflict is going to be biased and will channel most of its negative energies against those whom it perceives to be its enemies. A society in conflict will delegitimize and stereotype the other while nurturing a sense of patriotism, victimhood, and righteousness. Those observations are directed at reporters in the region, but are equally true of supporters in the diaspora. Journalists must be mindful of the connotations of certain words. They are not obliged to use the terms preferred by one side or the other, just as they are not obliged to champion or reflect one interpretation of the conflict. Your observations are one point of view – one that has been captured in the reporting over a long period of time – along with a range of views of Israelis. Mr. Whitten told you the CBC language guide described people displaced in 1948 and later wars as Palestinians “who fled or were forced from their homes.” The reasons he gave for this phrasing are valid in light of CBC’s journalistic policy on fairness, balance and impartiality. This term is sometimes used to refer to members of the Arab/Palestinian minority residing within the State of Israel, and who hold Israeli citizenship. Media use several names for this population: the Arabs of Israel, the Arab sector, Arabs in Israel, the Arab minority, the Arab–Palestinian minority, etc. It recommends the use of either descriptor in this way: “Arab/Palestinian citizens of Israel” – it would seem that either is acceptable. The CBC Middle East language guide does not list a preferred usage. CBC news managers might want to provide some guidance. I am told that it has been CBC practice to use the term “Israeli Arab” and that is the reason it was changed – to be consistent with that practice. The other important principle at work here is the reality that news stories are iterative, especially when it comes to breaking news. Mr. Whitten pointed out to you that there were multiple reports that day and information and emphasis changed as events unfolded. The coverage of the Land Day protests evolved and reflected facts as they became known. The lead on The National piece, read by Ian Hanomansing, began with the report of 15 dead and 1,400 wounded. Your concern about the AP story on the CBC website was that it somehow implied the killing was the fault of the demonstrators. In fact, the first part of the headline in the last update was “At least 15 killed as Gaza-Israel border protest turns deadly,” which puts in the emphasis on the death toll. That demonstrators threw rocks and Molotov cocktails is part of the report, as is the presentation of the fact that Israeli forces used live ammunition which caused deaths and injury. The mention of the protestors’ activities does not imply blame. The piece itself has multiple voices from a range of perspectives. As is appropriate, the report presents what happened – it is the reader or viewer who forms his or her own conclusion. In at least one report Mr. Stoffel included the information that Israeli human rights organizations were calling for an investigation. The reality for this news service – and most others who try to present facts and analysis in a fair way – is that it will be attacked by those with a strong commitment to a point of view and narrative. Anything that does not conform to it is often considered unfair or biased. It has been the practice of this office to consider all complaints and judge them on their individual merits. I can tell you that Mr. Whitten is correct when he says the two examples you cite, quoting HonestReporting Canada’s assertion that they have influenced the reporting, is two of many that come to this office. They also come from other interest groups. There is no merit to your contention that CBC News is beholden to any side in this conflict. CBC News and current affairs have presented many stories and interviews which reflect the views and analysis of both the Israeli and Palestinian perspectives. The stories did not violate CBC policy.